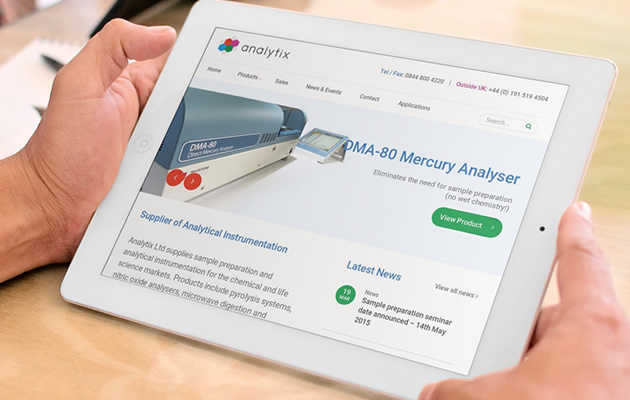 We’re pleased to announce the launch of a new website for scientific instrument specialists, Analytix. We have worked with Cathyrn and Simon Osborne to redesign their website to give the business a more dynamic online marketing tool. The previous version of their website did not validate the level of product and service they offer, being dated and containing static content. The new website allows the business to showcase their client’s products and be better recognised as leaders within their field. Latest news and product information will keep the new website looking fresh so existing customers can observe and be kept up to date with the latest from the sample preparation and analytical instrumentation for the chemical and life science markets. We’ll also be working to optimise the website for search engines (SEO) and provide ongoing content marketing in the form of technical SEO and news/blog articles. If your website is in need of being updated or redesigned to help promote your business, then please get in touch. We’d love to hear from you.